My travel in the last few weeks has been on a smaller scale and/or of a more culinary nature, but I’ll take it, if it doesn’t involve a TSA agent raising her eyebrow at my cargo pants (really?). Below are details from this past weekend’s adventures in town. Late Friday afternoon I attended Change the World by Design: 5 Ways to Create Social Impact. This was an inspiring bundle of presentations and a thoughtful panel discussion about how people trained in design are particularly well prepared for developing social solutions. Curious about that “how”? Design for Good Associate Director Sandy Wolfe Wood chose great words in her introduction: “…we designers are good at dealing with mess….” As the discussion continued, other notable comments included Tara Pham’s response to an audience member’s question, “what is ‘design thinking’?” She offered (pardon me if I paraphrase too much) that designers ask the simpler questions. I’m guessing ones like “what exactly do we want to do here?” And, designers demand answers. For the CityPulse project that she presented, these skills had proven to be very helpful. Designers tend to develop solutions with the future in mind, rather than the present, and this is a great approach for social change. I mention the U (the University of Minnesota, in this case) as the presentation was in Rapson Hall, on the Minneapolis campus. This was my first visit; it appears to be a newer building for the U’s College of Design. What a treat, especially since my past experience with design at the U was when it was housed in the St. Paul campus in the “college of human ecology.” Its building there didn’t seem appropriate, other than in the fact that someone was being resourceful by using it, at the time. It was full of light, activity, and an obvious variety of spaces – so obvious that at first I wasn’t sure if the large interior space (see photo linke below) was the auditorium to which I was headed (it was not). Here’s a photo of the Rapson Hall interior. I wanted to explore it a bit more; in that central area and down a few of the ramped hallways were various student projects that seemed worthy of a closer look. But, the parking garage clock was ticking, and I had to leave. I didn’t get a great look at the exterior, but perhaps that was due to the fact that I was more of a drive-by (or drive-in, drive-out) visitor, and college grounds are better experienced on foot. As such, I’m really looking forward to the completion of the light rail line that will be able to take me there, without my car. 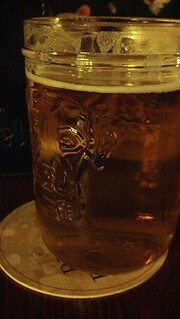 A frosty beverage from Petaluma on Friday, at the Bulldog. Skyfall! Bond movies had a strong impact on me, growing up. One thing I’m particularly fond of is the travel: in each film, 007 typically hits four or more colorful, noisy, elegant, and/or fantastic locales. The other excitement in the films –Guns! Women! Diabolical bad guys! Terror! Style! Judi Dench!– plays a significant role. However, Bond’s globetrotting, or rather, globesprinting, has been key to my enjoyment of the films. Skyfall’s opening shots in Turkey may compel me to make that trip happen sooner, rather than later. Four St. Paul neighborhoods. Twice. From one edge to the other, and back again: On Sunday I ran 13 miles, starting from my house. My Adidas’ soles kissed pavement in the communities of the West Side, West Seventh, Summit/Crocus Hill, and Merriam Park. Then, all the way back through all of them. Running 13 road miles at a time of year when I really don’t need to was perhaps indicative of my lack of control over my running habit. Still, I had a cause! Early last week I was thinking I’d probably get out to a park for a fun 2-3 hour trail run with friends. So, when I noticed a challenge on the DailyMile site to raise a little money and awareness for the people affected by Hurricane Sandy, run4nyc, I committed to a “virtual half marathon,” which I had to complete by Monday. My trail run plans fell through, and I ended up doing the run on pavement and on a cold, windy day that even strafed me with ice pellets. It was nowhere near as unpleasant as having a hurricane wash away my reality, but it seemed fitting that 13 miles was particularly difficult, mostly as I hadn’t run more than six miles since October 7. 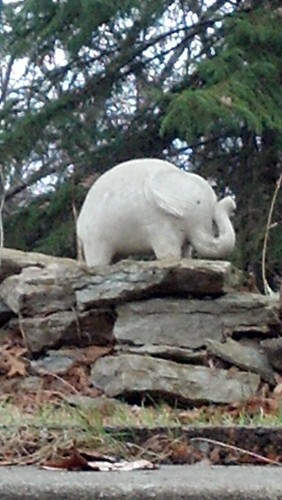 Around mile 10 I passed an adorable elephant statue (pictured above), which evoked Ganesha, the Hindu deity that is known as an obstacle remover. The inspiration was a helpful boost – at that moment I needed help removing the obstacle of sore feet and low energy. Italy! Gelato has arrived in St. Paul, and after picking up some groceries I stopped by the new Cow Bella for a treat. The Amarena (Italian Sour Cherry) was most excellent; the Gianduja was a nice complement. Sunday’s crisp temperature assured that a few spoons of the serving made it home for Steve to sample. For me, sourdough originated in my mom’s fridge in a glass jar with a rubber seal. Given my family’s frontier history, sourdough means old west coast to me: miner forty-niners. Tiny men standing by enormous trees with saws that require two men to use. If you look it up in Wikipedia, you learn that, like many things, it originated in Egypt. So be it. My starter came directly from King Arthur Flour, this past July. Since then I’ve been learning the ins and outs of keeping it adequately fed and using it to bring food to our table. On Sunday, I was resolute on using the starter to make the dough for a calzone recipe. Cold weather, my preference to knead with the KitchenAid, and possibly just a little too much flour made for a less than supple dough ball, but we made it work. We ended up with eight lovely little gaping maws pockets of pepper, tomato, cheese and sausage on the table by 7pm. That’s my “local traveler” report for the week. How do you travel, when staying at home? ‹ PreviousOk, winter, I’m ready. And I’m always jealous of your food highlights – would love to try EVERYTHING you make!! !